Aleksey from Satanath Records did sign the duo Lava Invocator in order to release their debut via this open-minded Saint-Petersburg located Metal label. It is like a young (formed in 2015) side-project by two Def/Light (post-RB) members, Ingvaar (guitars and vocals) and Silent (bass), formed through inspiration created by iconic legends such as Mayhem, Dissection, Dark Funeral, Ulver and Darkthrone. With assistance of drummer Yggr, they did record this first official work with Sadist (Alex Samovol) in their home country, Ukraine. It results in an album available in digital format and on compact disc, the latter including a four-page booklet, limited to 500 copies worldwide. The material gets released in the unholy marriage of both Satanath Records and More Hate Productions. Mörk (which means ‘dark’) starts with a short instrumental intro (called Awaken) before sonically defining their appreciation for the Scandinavian Second Wave majesty, cf. the source of inspiration as mentioned in the first paragraph. Indeed, this is nothing else but an honest tribute to the Nineties scene from Sweden and Norway (and relatives)! 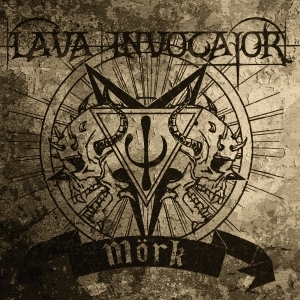 In general, the Black Metal performed by Lava Invocator combines the melodious aspects of the Swedish scene with the epic ones from Norway, spiced with a general trans-Scandinavian (or better: European, like in ‘Nordic’) attitude. It’s quite varied in structure and speed, with several tempo-changes and interacting song structures. The main speed differs in between mid-tempo to fast, including a couple of blasting eruptions, and with some slower excerpts as well, like the mighty hymn Black Dawn (what a fabulous drum structures and grandiose hypnotic riffing). It’s directive and straight to the point, yet filled with a crafted song writing and ditto execution. The overall atmosphere brings an obscurity reminiscent to the aforementioned scenes too, getting strengthened in its abyssal darkness by the sublime sound quality: rough and edgy, unpolished and overpowering. Once in a while, there’s a trashy edge too, rather referring to the late Eighties and earliest Nineties (cf. Gestapofallos, with its mostly violent nature, or Totenkampf, with its thunderous drum salvos, punky details, a dreamlike slow-paced intermezzo [with a cool solo], and those razor wire-alike screaming vocals). Sporadically, Lava Invocator use some mesmerizing keyboards too. In a piece like Dark Thunder Sky, it covers the whole in a mysterious veil of secrecy, which goes very well with the immense and grooving energy of the track. And at the beginning of the title track and during its intermezzo at about four minutes, those synths somehow create an esoteric, even sacral and divine atmosphere indeed! So, as you can read, Mörk is such album that might appeal to every open-minded adept of that fine Nineties-school. It might lack of modern progression or prominent originality, but I do not give a damn on that. The result (song writing, performance and sound, plus the sober visual package and lyrical concept (though, there are no lyrics printed, unfortunately) is highly qualitative in all aspects.